Estonia_1442 - Hello Estonia City of Tallinn | Flickr - Photo Sharing! Took a optional day trip to Tallinn, we were met by a tour guide and saw some interesting things. Tallinn is the capital city of Estonia and was founded in 1157 A.D. It is considered one of the best preserved medieval cities in Europe. The city lies 37 miles (about 60 km) across the Gulf of Finland from Helsinki. 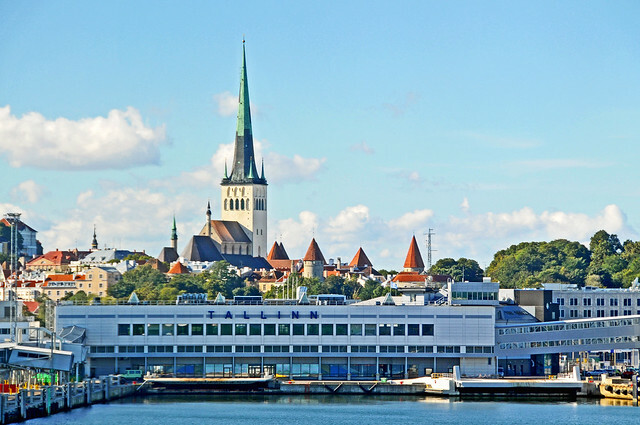 Tallinn has been designated a UNESCO World Heritage site. Estonia is the smallest and northernmost of the Baltic States. The Estonian people are related to the Finns and have rich ethnic customs, which they have retained, even though they have been an independent country for less than 30 of the last 500 years. For most of the last three centuries they have been ruled by the Russians, from whom they regained their freedom in 1991. The country is mostly flat except for some highlands in the south-eastern corner. Islands off the western coast make up 10% of the country's area. T i s d a l e, and 27 other people added this photo to their favorites. I am charmed with wonderful Stonia. Very beautiful images Dennis. Excellent shot of the city and those ships are gigantic, semi's are large and they look like toys against the ships. Beautiful photos and very interesting information!!!!! Beautiful image of boat & City,,,,,,Great trip ! Beautiful city and cruise ships!!! Very Nice, Dennis!!! Very nice view well taken! Wonderful colours and clarity ! You are really lucky to have such a fine weather, at this time of the year. I have never been here but it is on my list! Fantastic shots, I love the sharpness and the colours!! !